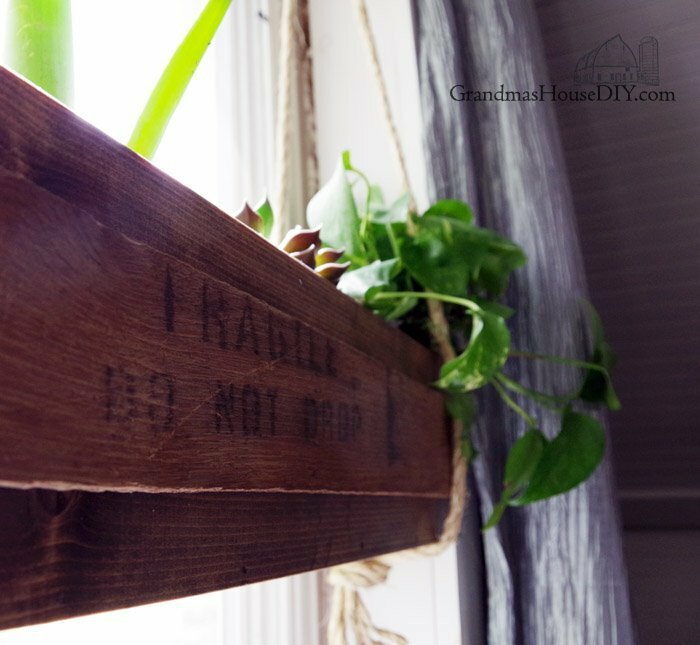 Flower boxes: Wood working DIY hanging flower boxes in our master! 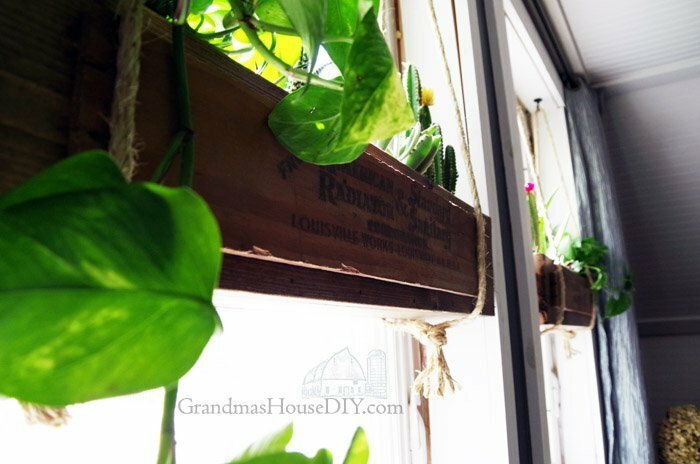 Flower boxes: Wood working DIY hanging flower boxes in my master! 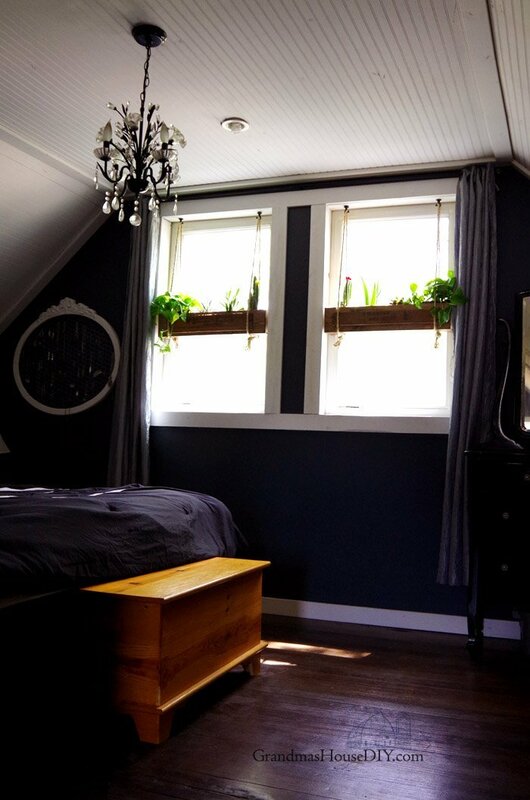 This post is about how I built hanging flower boxes for my master bedroom! So this past winter I kinda went stir crazy with cabin fever. There really isn’t any explanation for it as we had an actually VERY short winter for us. But that doesn’t change the fact that I really did have a tough time personally. I just got so tired of the daily grind and the gray and the white and the never-seeing-the-sun and the every day being the same. Ugh. 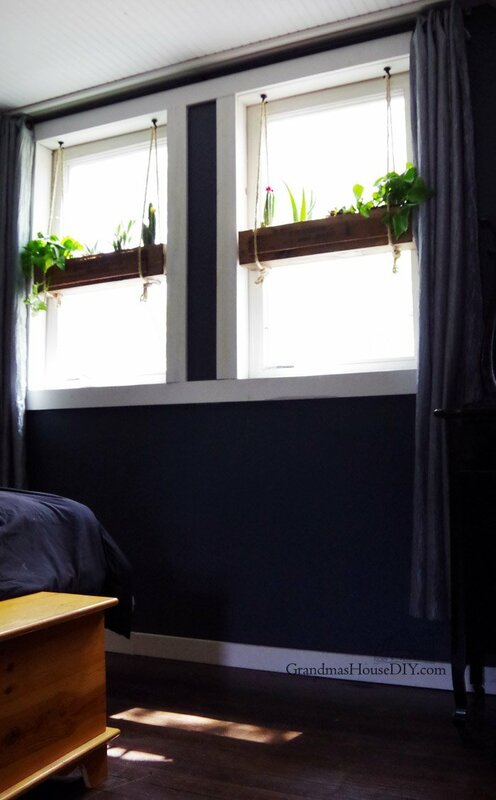 So, it occurred to me that maybe something green and growing in my master bedroom might just help brighten my winter days a little bit. So, I got to planning my flower boxes! 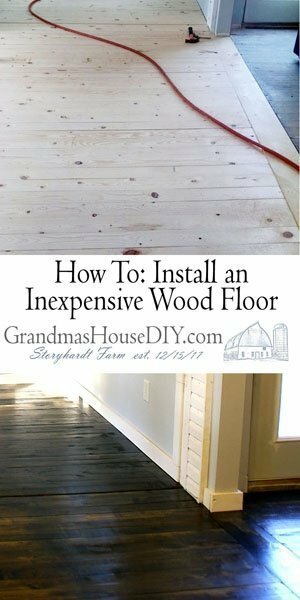 Check out Saw Hub for more fun and simple DIY wood working projects! I decided to hang them because I have egress windows so I couldn’t put them on the sill where the crank handle is. At 27 inches wide I knew I could use 1x6s cut at that length and then a 1×4 in the bottom creating the depth. I gathered my materials and cut all of my pieces before assembling. 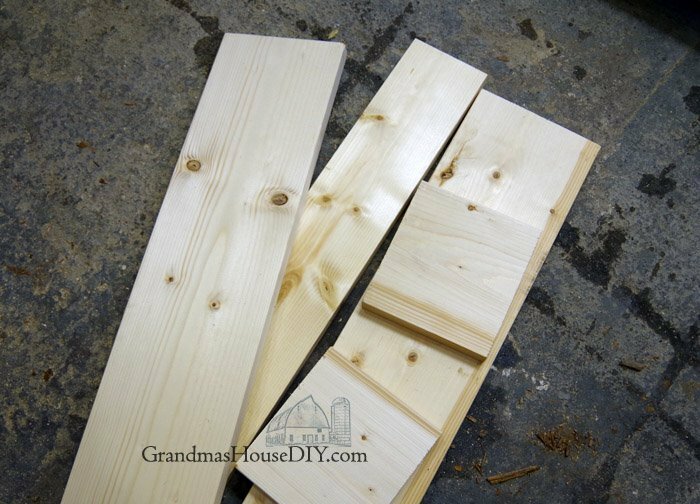 To assemble I used my brad nailer with my air compressor, you can use screws in this case but make sure and pre-drill before hand, anything that’s only the depth of a 1x will split. Once assembled I stained them with Minwax dark walnut stain and added some old wood to the fronts for character. Remember how that old sink I used in the basement came in its original crate? Yup those two boards came off of that! My next issue to deal with: How was I going to make these water tight? I looked all over for plastic inserts but none of them were the right size so I had to get creative: I caulked all of the inside seems (that is just a gray pure silicone caulk I had on hand) and then pressed a garbage bag into every corner and nook and crany and then cut off the excess. I then added even more caulk along the top edges (and that is just a clear pure silicone caulk that I also had on hand) to keep the garbage bag totally in place and let it dry over night. To plant I added a second garbage bag (just to be sure we were TRULY water tight) and a layer of pine cones for both drainage and to help keep the weight down. From there I just used regular potting soil and planted. 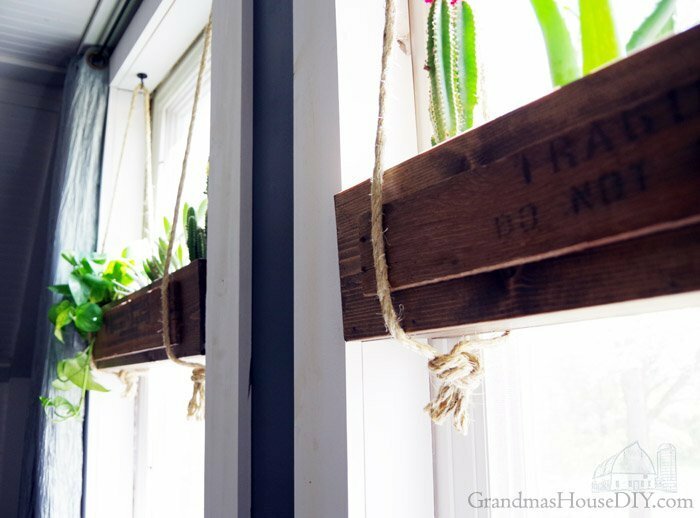 I measured out from the edge of the window to the edge of the trim to center the hooks and make sure they were all the same distance out from the sides. The hooks I used I had on hand leftover from my mom’s chandelier. I did a little bit of pre drilling with a VERY small drill bit as I was having nightmares of these planters crashing down in the middle of the night SO they were VERY hard to screw in. 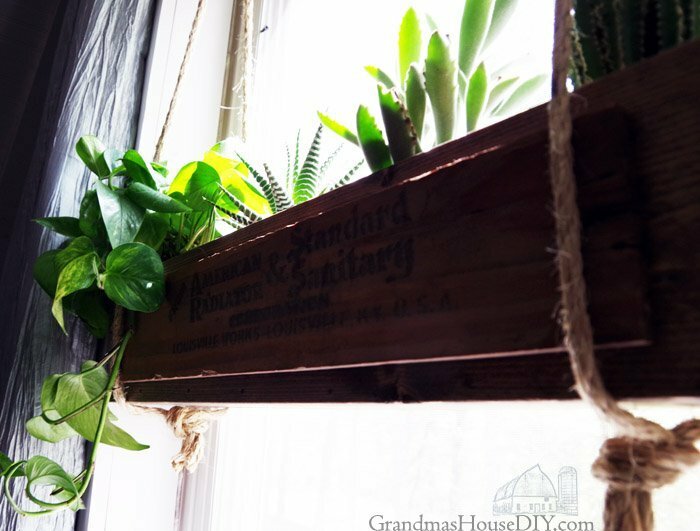 From there I purchased 50 feet of 3/8″ sisal rope from my local fleet store and it was just the job of cutting four pieces to length according to where I wanted the boxes to hang in the window. 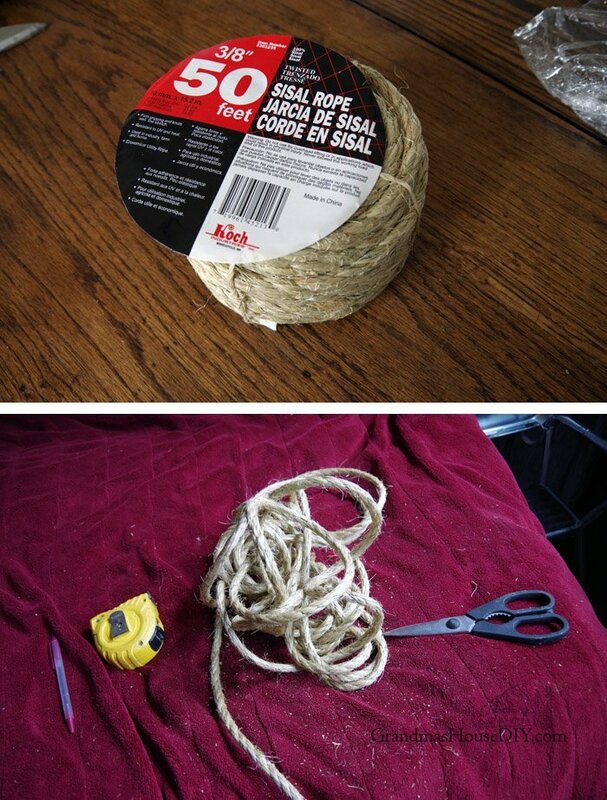 With them cut I tied a knot in them all at the same place and looped them over the hooks. Oh now we come to the moment of a blogger facepalm, I was in such a rush to get these flower boxes built (and really excited too) that I forgot I had measured with the fact that I was going to put the sides/ends INSIDE of the walls of the boxes, just like I did with the bottoms. Yeah, so, I didn’t do that. So after all of that work I brought my now lovely (and fully planted and rather heavy) planters upstairs and they were 1/2 inch too wide. REALLY!? So, as you can see, the planters with the sides/ends that I had finished and planted are missing those sides/ends in the after pictures of them hanging in the windows. It wasn’t a huge deal and only took me about ten minutes to fix but boy was I fed up with myself. So, I popped off the sides/ends (carefully peeling the caulk and garbage bag off of them) then cut them down, put them INSIDE the walls and bottom, tacked them into place with my brad nailer and then hauled the flower boxes back upstairs to finally loop them into the rope and call it a day. Will do some general cleaning at home next week. I wanted to have some mini garden on my bedroom or maybe in the living room. Anyways, thank you for sharing this. Will be saving this on my bookmarks <3. Cheers! SO stinkin cute! Love this idea. Love these! That touch of old wood on the front makes a world of difference. These look really great. 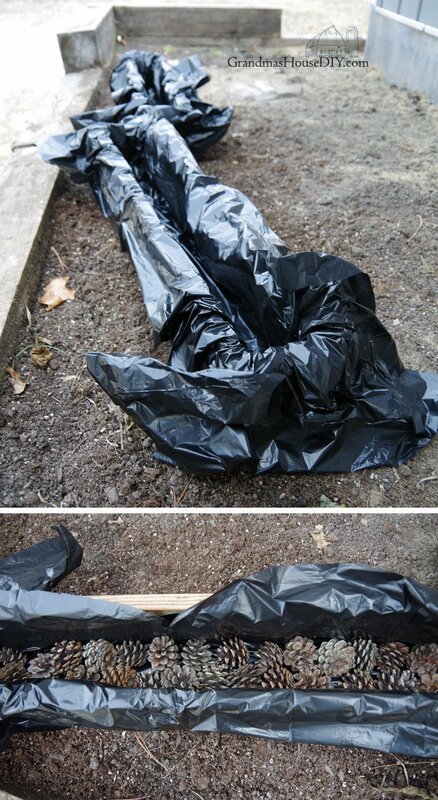 Your idea of using caulk and garbage bags to make them watertight was inspired. The planters are really cute. I especially love the addition of the crates! They add so much interest. Thanks for sharing with SYC. That’s such a clever idea! 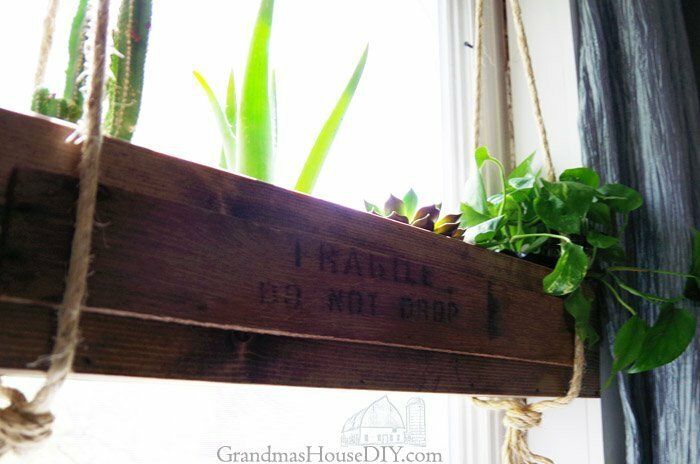 I love that you put some old crate wood on the front to give them age and interest. I’m impressed with your construction-ability. LOVE these! And the way they hang right inside the window frames is fantastic. Thanks so much for sharing at the #happynowlinkup! Thank you so much Leslie! Hi Tarahlynn: Your having another busy week I see. Your home must be a beehive of creative activity. The flowers boxes are fantastic because you added the sides of the old sink box. It makes them one of a kind. 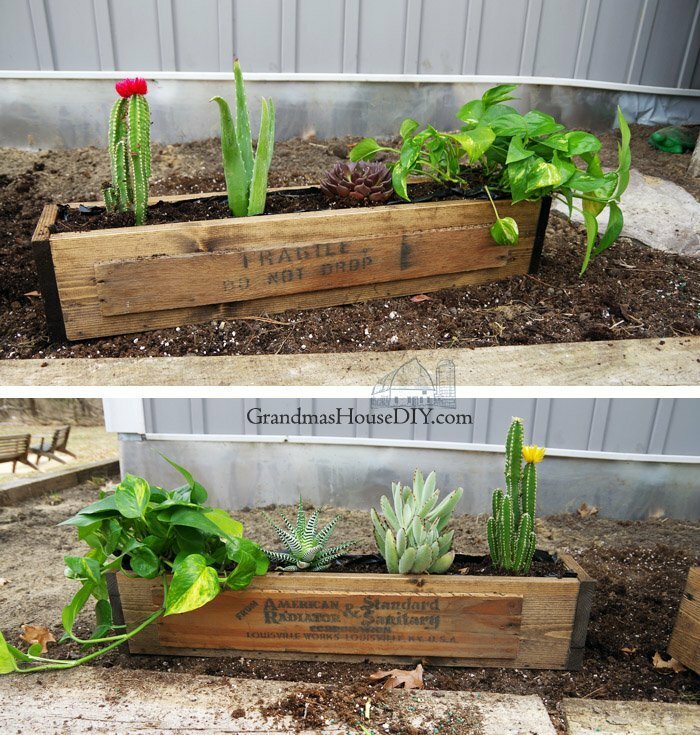 What a awesome way to reuse the old box pieces. These are wonderful! 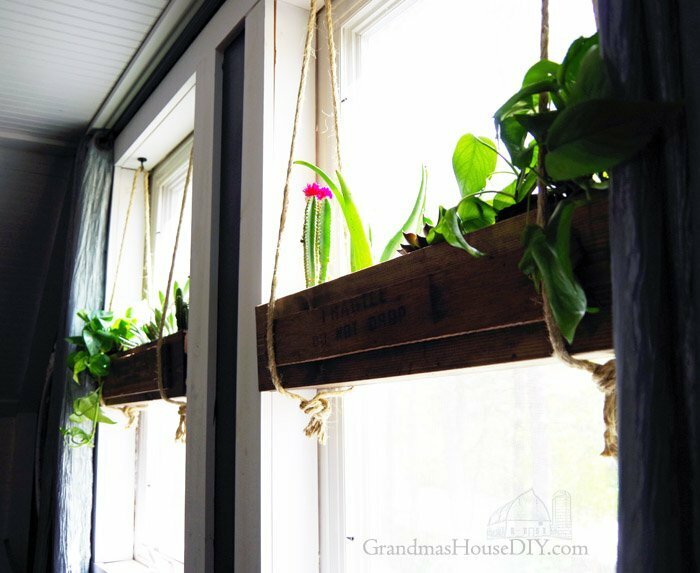 What a great use of space and how beautiful they are hanging in the window! Hey Michelle, exactly what I was thinking, hopefully these will make winter a little easier for us too! Have a great week! I love your planters with the old crate front pieces – makes a world of difference. 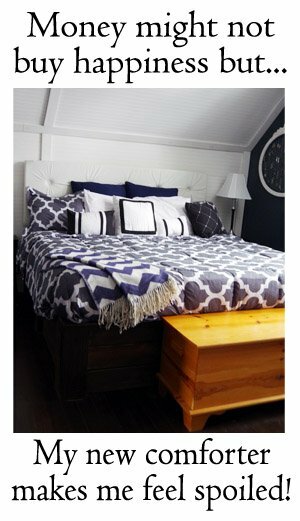 Isn’t it wonderful to add some green to a room especially when you are having winter doldrums? Planning on trying these myself. Thanks for the idea. Yup I definitely need to bring in some more green and growing things to help me through next winter 🙂 Now I just need to get better at keeping them alive lol! Thanks for coming by Kristin! Thanks for coming by Cindy!! these are sooooo incredible! the crate wood on the fronts adds the perfect touch of character. wonderful tutorial, too. pinning. Thank you so much Audra! LOVE your planters Tarah and am featuring them tomorrow at Vintage Charm! The idea of adding the pine cones is really smart Tara. And of course they look great. 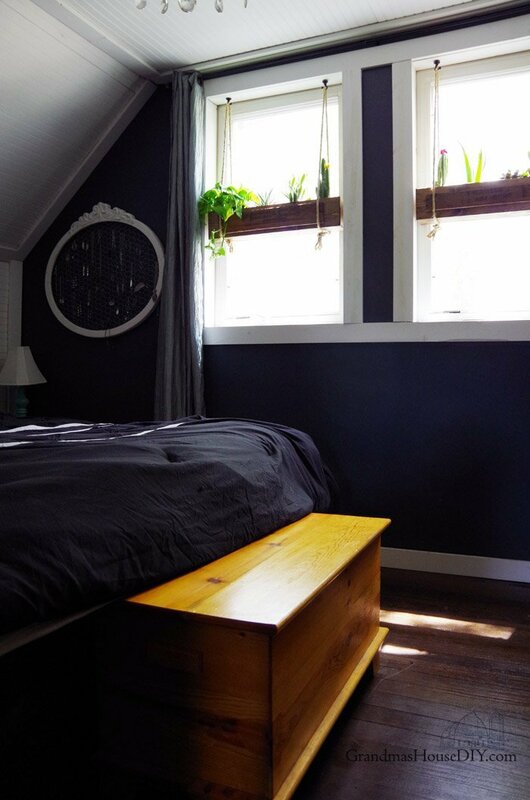 A simple and green way to add a little sunshine in your room. 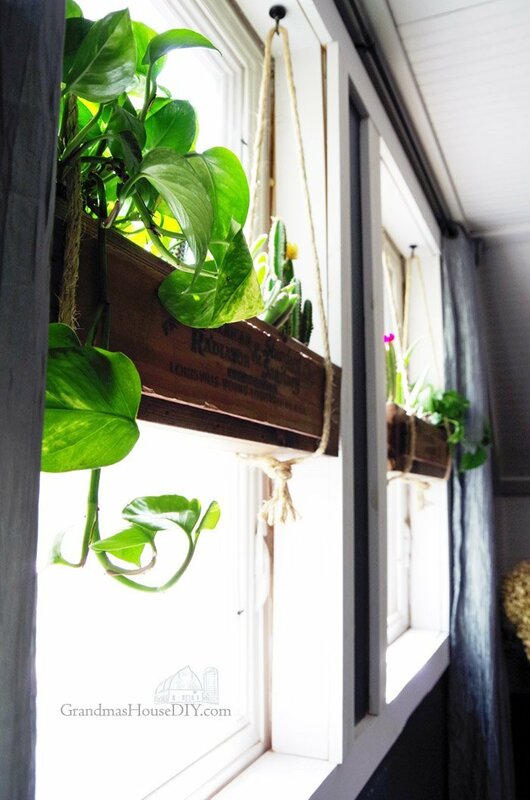 I love your window boxes,a great place to hang them too. Have a wonderful day. Thank you so much Marlene, have a great day too! Love these boxes, Tarah! 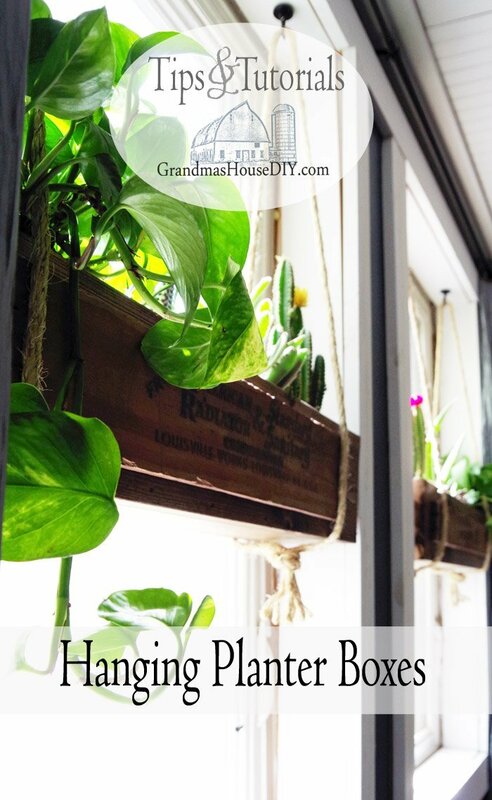 They are so charming and such a good idea hanging them in the window. Pinning. Oh wow I love these so much! I might have to make some! Thank you for the tutorial. 🙂 stopping by from the creative circle link up! Thanks for coming by Jenny! Hello Tarahlynn! Your planter boxes turned out great!!! Just stopping by from the Happiness is Homemade link party. 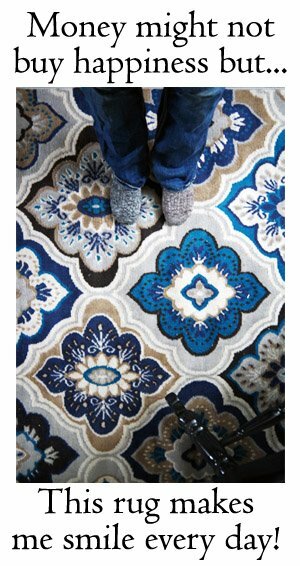 A little late as I’m getting here on the weekend, but still great projects and ideas! Shared to my Garden Projects page on Pinterest for you. Thank you so much Barb, have a great week!